Super huge thanks to Zachary Tringali for the guest post! If you don't already, you can follow him on Twitter and check out his website! He is super cool, and you might remember him from the Pirithous vs Pelagia grudgematch of doom. All this to say, he writes like the wind and never fails to get me motivated again when I falter at my own writing projects. I know, you’re surprised, right? More specifically, Irish history oral tradition. Even before stories were written down they were being told, people shared stories of great heroes and the ability of one person to make a difference. The Táin Bó Cúailnge is one of Ireland’s great epics (comparable to the Iliad) that have been altered to fit the location of the telling over time. Undoubtedly details have changed, but the basic structure has been preserved. 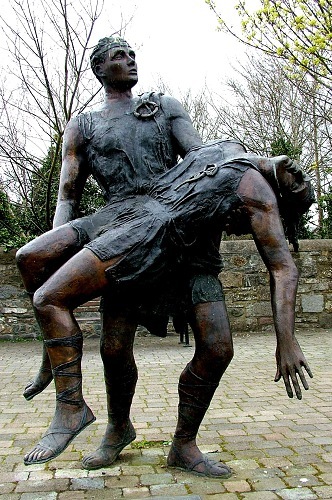 Cuchulainn (koo-HOOL-in) is a figure of Irish myth that deserves to stand among the greatest, Theseus or Heracles. He, better than anyone, could demonstrate the way a single song could change the fate of a man. Cuchulainn became friend and foster brother to Ferdiad when he was a young boy training with the famed Scottish warrior-woman Scáthach. Ferdiad was older than Cuchulainn, and though they were evenly matched in skill, akin to an older brother to the hero. Cuchulainn stood alone against the entire Connacht army and held them back from crossing over. When he had defeated a majority of their best soldiers, Maeve settled on Ferdiad who she found to be the closest of Cuchulainn’s matches. He refused her—a mistake few men made twice. He held out until the matter of a song came up. Maeve threatened him with one of the only things that could probably move a warrior bound by honor. She threatened to have a bard sing a song of him so vile and terrible that he would die of shame, his name would be remembered but not at all in the way he’d want it. So it was a song that finally sent Ferdiad against his friend and brother (albeit there was treasure involved as well, but let’s face it. It was honor that held him back and honor that pushed him forward.) He fought with a man who, before he was even a teenager, was killing grown men. Without anything written down, who would know him for anything but what a bard would sing? 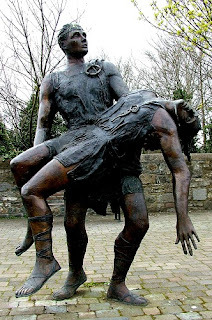 They fought for three days, Cuchulainn consumed by battle rage and Ferdiad fighting for his life. At night they would send small tokens of peace to one another: food, herbs for healing and the like. Tokens that beyond it all they were still brothers. There you have it. A song with the power to turn a man like a mountain into a shadow. You know, I've never been a huge fan of Cuchulainn, but that's a great story. Prefect timing. I dipped into Celtic mythology (as well as Nordic) in my current fantasy serial. One of the characters is even named Cu (Hound). This will make for a great Tweet of the Day.